This is a rectangular curved Old Dutch Cleanser porcelain sign. This particular Old Dutch Cleanser sign is predominantly yellow and red with white text. 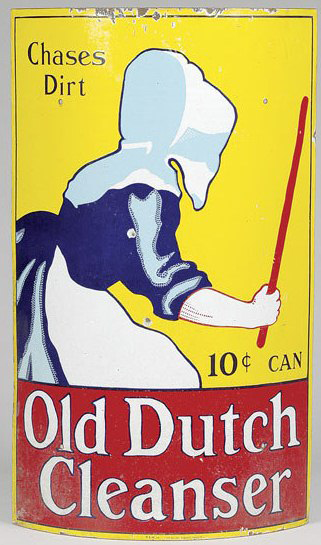 It reads, “Old Dutch Cleanser, Chases Dirt, 10 Cents Can” and features the back of a woman wearing a white bonnet and apron in the center.